Bladder cancers are often diagnosed after an episode of haematuria, or visible blood in the urine. Occasionally they are detected after the discovery of microscopic blood in the urine, that is a small amount of blood that cannot be seen but can be detected when urine is examined under a microscope. Tumours growing in the bladder can also irritate the bladder causing symptoms of overactivity or discomfort which is another way that such tumours come to light. Bladder cancers can be superficial or confined to the lining of the bladder or they can be more invasive involving the muscle layer of the bladder. The more superficial bladder tumours can usually be treated quite easily by cystoscopy (telescopic examination of the bladder under anaesthetic) using cautery and biopsy to remove the tumours. It is common for such tumours to recur and even after treatment of the initial tumour, surveillance for recurrent tumours is planned for many, many years. 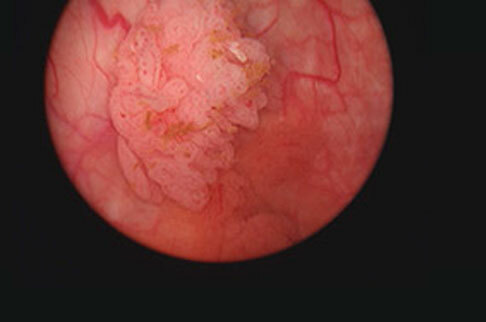 Invasive bladder tumours involving the muscle layer of the bladder cannot be controlled by simple biopsy or cautery and usually require much more aggressive treatment such as surgery to remove the entire bladder. In some instances radiation is also used to treat these type of tumours. If the entire bladder is removed the urine flow needs to be diverted and often a small segment of bowel is used to form a conduit to allow the urine to drain into a bag that attaches onto the abdominal wall. In certain situations however a new bladder (neo-bladder) can be created out of bowel in which case there is no external collection device and in most cases patients can void quite normally. Even if you have a single episode of blood in the urine or if blood is detected on microscopic examination it is important to be fully investigated to exclude bladder cancer. Of course there are many more common causes for blood in the urine including infections and stones.